Sequential Circuits Inc. Drumtraks drum machine self-titled full-page colour advertisement from page 55 in the June 1984 issue of Keyboard Magazine. Not too many ads are self-titled. Usually there is some kind of cool or witty ad-title - or at least a subtitle. Not this one. 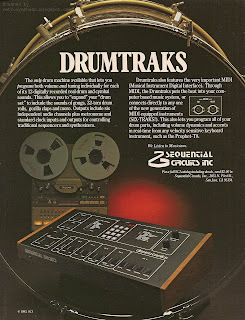 "Drumtraks". That's it. Says it all. And may be kinda ballsy if they did it on purpose. But what I know is ballsy is the amount of power this drum machine had under its hood. 13 digitally recorded sounds with programmable pitch and volume. I don't know whys, but I love songs with pitched-down drum sounds. Pitched so far down they get gritty. Hand-claps especially. And SCI has a word for them - gorilla claps. How awesome is that! I'm gonna have to remember that one. 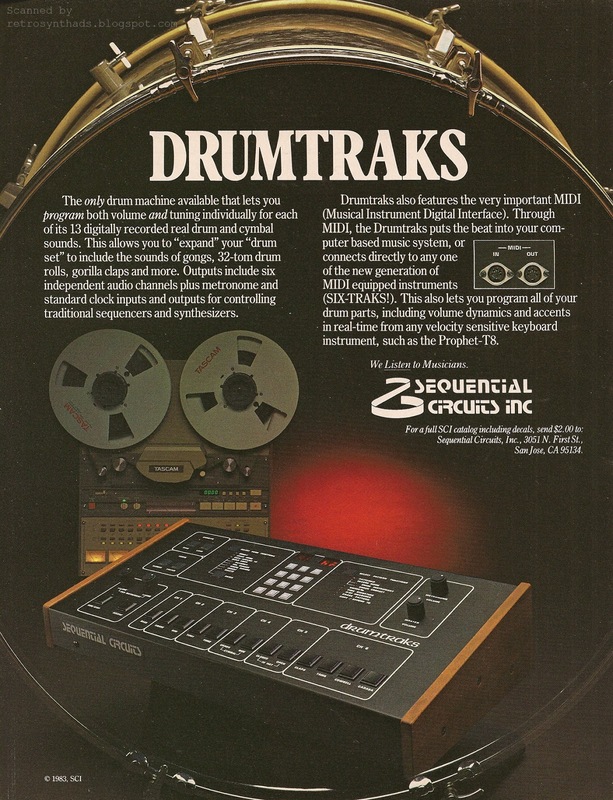 This Drumtraks advertisement appeared in Keyboard Magazine from June through December 1984. What makes it unique is that it appeared opposite the SCI Six-Trak advertisement that also appeared during the same period. And even better - they were centerfold ads. Two totally separate and independent ads, in the centerfold. Again... ballsy. So, as you might have guessed, it wasn't by mistake that the Six-Trak and Drumtraks ended up, more often than not, included in the same sentence. They were fraternal twins at the most basic level. Two eggs from the same father (Dave Smith! ), fertilized at the beginning of the MIDI era. Okay, that actually sounded a little creepy. I should have left Dave's name out of it. But the two wooden-sided synths look so good next to each other that they pretty much had to have popped out of SCI's birthing canal one right after the other. And like many actual twins I knew and grew up with - Karen and Sharon, or Tim and Tom - SCI even kind of gave them similar names. Also like twins, SCI paraded them around the playground that is Keyboard Magazine, whether promoting them together in the same centrefold ad, or side-by-side as a pair of ads in the centrefold space. So, it makes sense that Keyboard Magazine would wrap the two up into one large Keyboard Report in the May 1984 issue. And for all you 37+ year old ladies out there, yes, that was the issue with Duran Duran's Nick Rhodes on the cover. The report, written by dashing Dominic Milano, runs about two and a half pages, with a shared introduction before separating into the two reviews - first focusing on the Six-Trak, and then the Drumtraks. As far as keyboard reports go, all the basics for each piece of gear are covered. And covered well. But, you won't be surprised to learn that I love this report mostly from reading it from an historical perspective. For example, at the time this report was written it was still the early days of MIDI, and the introduction of the two-gear report focuses on two advantages of this rather new standard. With the Six-Trak and it's sequencer, and the Drumtraks in mind, it is easy to see why one of those advantages is the universal synchronization between pieces of gear. Dominic notes the "frustration of trying to synchronize" drum machines and sequencers with pre-MIDI 24,48 or 96 pulse sync, and how MIDI, available on these two machines, will simplify this process. Dominic also touches on one other aspect of MIDI and drum programming that I'll admit was lost on me when I first got into MIDI - velocity sensitivity. For some reason it took me a while to realize that I could program dynamics on my MIDI drum machines from a velocity-sensitive keyboard. It saves *a lot* of time. 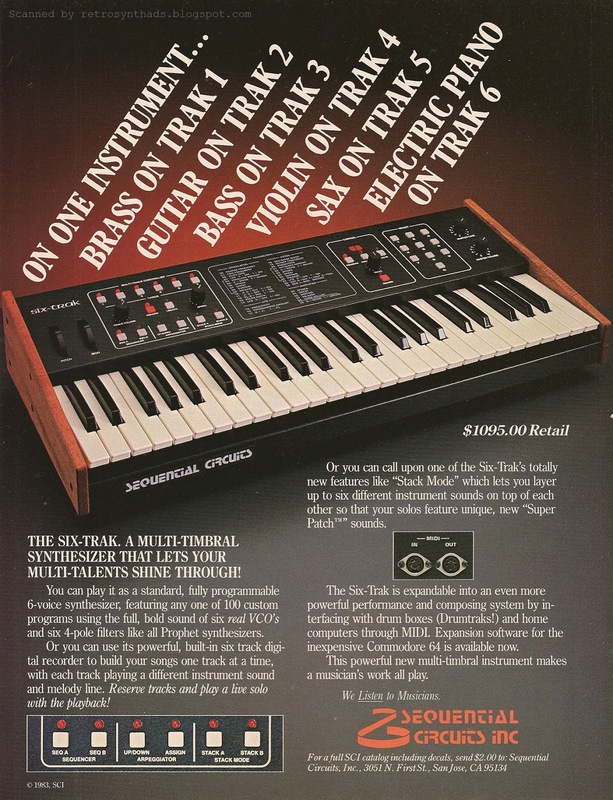 To understand just how amazing the Six-Trak was for its time, you just have to read Dominic's intro on the instrument, and in particular, its comparison to the higher-cost Oberheim polyphonic synthesizers. "Instrument makers have long wrestled with the problem of providing players with a way of playing independent musical lines with different timbres. The Oberheim 4- and 8-voice modular polyphonic synthesizers were instruments that gave you that ability, but the problem was, and still is, how to get the instrument to know not to change timbres when you cross voices." The Six-Trak solved a lot of the issues surrounding this problem, and at a fraction of the price. Sure, the Six-Trak is a much more basic synthesizer in terms of features when compared to Oberheim's delicious beasts, and programming through the Six-Trak's simplified interface is a bit of an annoyance when you are used to tons of knobs and sliders. But we are talking six monophonic synthesizers for $1095.00. Or, as Dominic put it, six monophonic synthesizers that are capable of "producing some pretty sounds" including a "good Micromoog-like bass". And a two-track 800-note sequencer thrown into the mix allows a programmer to get pretty experimental. Sweet. "The search for the better digital drum box goes on and on. This month's entry in the race is from SCI. Their machine offers a few surprises including MIDI and the ability to record and store in memory the various tunings and volume levels of individual drum sounds within each rhythm pattern." I've pointed out my surprise at the price different between the Six-Trak ($1095) and the DrumTraks ($1295) before. But I just have to say it again - I still find it hard to think of a drum machine with 13 digital sounds as being more expensive than a synthesizer. It boggles my mind. Put them together, and you get quite the package for under $2,500. The Six-Trak and Drumtraks just sound good when sync'd together. Some people may want to punch me in the neck for saying this, but connecting the two pieces of gear together creates a similar synergy that I also feel when I connect my X0X gear together and hit the play button. Growing up, synthesizer advertisements were the only way for me to find out about new synths. 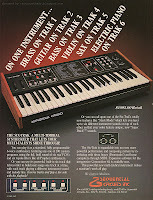 Gear advertised in magazines such as Keyboard Magazine and Electronic Musician. Chris Carter Chemistry lessons Awe. Awesome. pulsewidth - Linux+Sound Art Incredible.